This post will be full of SPOILERS, so if you don't like having your experience ruined, go rent the movie or buy the disk and watch before reading this. 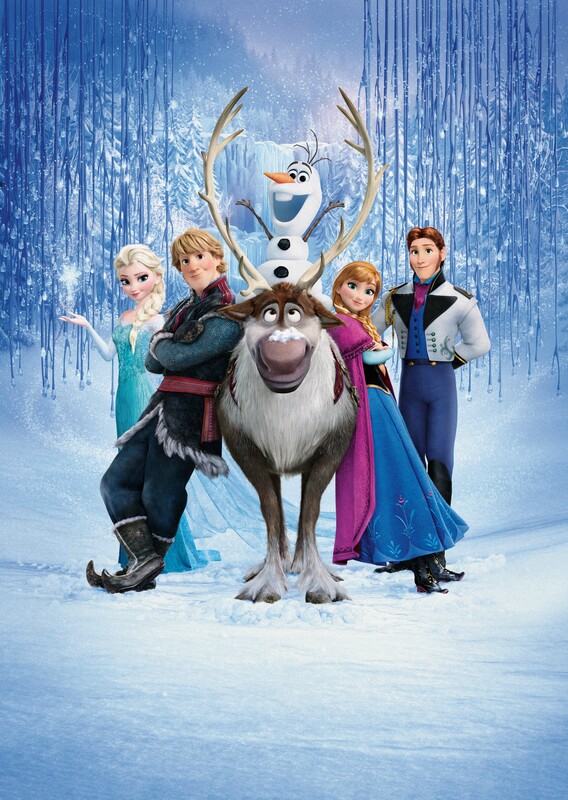 I finally got around to watching Disney's "Frozen", and I'm afraid that despite all the hype and glitz, I didn't much like the story. Keep in mind as you read this that there's a lot to like about the show. It's got fine animation, and it's entertaining, and there's a lot of music that's sure to enthuse an American audience. For a child's movie, it's fine. But I'm not a child. I'm an adult watching the movie from an adult's perspective. As I believe that family entertainment should be equally satisfying to ALL members of the family, I'm here to bring my adult perspective. I did not see this in the theatre. Rather, I waited for the Blu-Ray/DVD home release. And about that release... I am gratified to note that Disney has implemented "Fast Play" here so that you aren't forced to sit through innumerable trailers. Instead you can press the Menu button at any time to get to the disk menu. This is especially appreciated on repeat views! All DVDs should be structured this way. Also, I originally opined on this immediately after my first (and a half) viewing. A friend suggested that I'd like it better if I viewed it again. So I did. My first impression of the show was obviously informed by the trailers and by the ubiquitous clip "Let It Go", as seen on YouTube. From these I expected an astonishing soundtrack and supremely good character animation. I was also informed by The Snow Queen, a story by Hans Christian Andersen, who is one of my all-time favorite authors. So I was interested in how they'd handle this story. I'm genuinely pleased to note that while this is inspired by the Andersen story, the inspiration is about all that remains of the original work. That's a Good Thing(tm) I don't think I could handle another hatchet job such as the one Disney did on The Little Mermaid. In the opening credits we're treated to a musical score consisting of traditional music, which lead me to believe that this would be a telling that is sensitive to the culture portrayed... that of the Sami people of the northernmost reaches of Scandinavia. I thought back to the overt care given to Pocahontas' portrayal of native Americans, or the Frankish Ratatouille. And indeed, it seemed at first that this is what we'd get, with an opening number involving burly ice harvesters. But it doesn't last. From that point forward it becomes a thoroughly American tale, told in American fashion, sung in American show tunes, including bizarre American ideas of royalty. Only eight minutes into the movie, it simply stops making sense. Elsa, who is inexplicably born with magic frost powers, accidentally injures her sister Anna while playing, giving her a pronounced "ice cream headache", The King and Queen rush their daughters to some convenient Trolls, who they just happen to know well, so that Anna might be cured and have her memory wiped, and Elsa might be scared shitless for insufficient reason. I call these "Encyclopedia Trolls" because they really aren't necessary to anything at all except to earn the title of "fairy story" and answer a few obvious questions with obvious answers. Like real encyclopedias, they don't really do anything except replace the things you thought you knew with "facts" that you never knew you should have known. But in this case they're like a bad Wikipedia edit... Anna can't rely on the "facts" she was left with. And their warnings of Elsa's power merely cause her parents to forbid her to use or practice them, thereby guaranteeing that she will never have control over them. Following the accident and the visit with the Trolls the sisters are obviously and forcibly estranged. Eight minutes and thirteen seconds from the start of the first reel, you already know that Elsa's fear will be the cause of great consternation, that reconciliation with Anna will solve it, and that the kid with the reindeer will help her. Also, that the girls' parents are idiots who die young. Now, in the original story, the Snow Queen is evil, for supernatural reasons that are explained. She is unable to see the good in anything due to shards of a mirror made by an evil Troll. In the Disney adaptation, she's not evil in the slightest, and any problems she encounters are due to her fear of her own abilities; that fear having been inadvertently planted by the Trolls and cultivated by her parents as a result of their good intentions. The overwhelming feeling I got here was that we were being given the bum's rush out of the backstory. The important elements are so obvious largely because there's not much artistic attempt to conceal them. Symbolism is used to ludicrous extent, but I'll get to that in a minute. The ending of Frozen is actually much stronger than the beginning. This has all the earmarks of an idea that started in the middle. It feels as though they started with the big castle and a Narnia-like endless Winter and just worked out from there. Then the crappy storytelling turns into OK storytelling right around the point of the signature song "Let It Go", thirty-one minutes into the movie. Before that there are some moments, but they just don't gel. They have a resolution for the story, but are left with an ending in search of a beginning. However, they know they're going to have to have certain elements in place. It looks for all the world like the beginning was written last merely to provide those elements, checklist-fashion. The result is rushed and wholly unbelievable, even in a fairy story. The entire beginning might have been better told in flashback. I offer that as serious constructive criticism. We are to believe that these girls are forcibly locked, companion-less, in a giant empty castle for years, with nary parent nor regent nor governess nor servant in the picture. Yes, I know that Anna's visual isolation on the screen is symbolic of her feelings of isolation. But it's creepy as hell, and borders on child abuse. At a minimum, it's squarely in the zone of child neglect. I know that's not what they're going for. I know that the idea is to visually depict the sisters' emotional isolation. But in an animated film, what you see is what you get. This is pretty creepy. Meanwhile the wee village that serves as the kingdom manages to get along just fine without a government. The girls don't see each other for those many years, their sole interaction being that of Anna talking to an unresponsive wooden door, behind which her sister might very well be long dead. Anna, at the very least, has never received a lesson in how to comport herself as royalty, so she's a nervous, embarrassed, self-conscious wreck when she finally stands next to her sister at Elsa's "coronation" (I only say that because "tiaranation" isn't a word). Somehow, though, she turns into a pro from Strictly Come Dancing when it's time to waltz with a strange Mormon prince (ok, so he might not be Mormon. But twelve older siblings, and those are just the brothers? Sheesh!). The writers pay lip-service to the folly of falling in love with someone you've known for a day, while replacing one lightning-fast romance with another much like it, save for the fact that the new guy dresses down and has a steady blue-collar job (and also multiple personality disorder... an interesting and entertaining answer to the "talking animal" meme). The dangers of an icy or frozen heart are mentioned, but poorly. Whereas it was originally intended as a metaphorical device (Kay's heart freezes and this is reflected in his behavior toward his sister Gerda), the Disney crew didn't leave well enough alone. Rather than deal with that more difficult theme, they just decided to literally, physically freeze Anna. Not just her heart... the whole princess. Now, this might actually kind of cool if there were even the slightest hint of consequence for this. But there isn't. See, Anna just spontaneously gets over it, due to her willingness to give her life for Elsa. Now please remember that she actually did nothing of the sort... she had already been killed by Elsa, and her physical death simply took a while... but her mere willingness to die was the expression of love sufficient to thaw her out with no effort whatsoever required on Elsa's part. A completely consequence-free, blame-free, effort-free resolution. But an icy heart has no meaning at all for Elsa, who is motivated by fear of hurting the ones she loves. There is zero indication that she views anyone in the world as would one with a cold heart. But her own sacrifice... her own expression of love... that of leaving behind her home and kingdom for self-imposed exile... has no reward. Even in Disneyland, Life ain't fair. So here we have a wonderful theme introduced right at the beginning of the movie and then inexpertly squandered. (or "expertly squandered", if you consider that squandering is something that can be done in expert fashion). On the other hand, they subvert the "true love's kiss" meme in favor of familial love, which is a fine thing to do. Sisterly love is still love. After Sleeping Beauty and Snow White, I think it's time to look beyond a romantic link-up to break a spell. Who was running things until Elsa came of age? There must have been a regent, of course, but who was that, and why didn't they get screen time? Whoever it was didn't even get a mention in the credits, although "Spanish Dignitary", "German Dignitary", and "Irish Dignitary" did. Remember, this happens on the day of Elsa's coronation. The reigns of power were just then being transferred. So when Elsa ran off, where was the Regent then? Surely that's where you look for leadership, and not the under-age Anna. You remember Anna, don't you? The kid who was never taught how to act like a royal? Anna then runs off after Elsa and leaves in charge... the thirteenth son of a foreign king? Where was the Regent then? And when the thirteenth son of a foreign king runs off to join the pursuit, who does he leave in charge? Where was the Regent then? "Marriages" that are accomplished in private, without a witness, on the word of a complete stranger who just arrived as a coronation guest, and now claims to be King; are apparently legal in Arendelle, and the people and nobles (of which there are none in evidence) are OK with that. In a Disney kingdom, foreign guests can be charged with treason, as opposed to sedition. For the record, you can only be a traitor to your own country. I don't expect children to know the difference, but I absolutely expect the adults who write these stories to know. And I expect that children will never know if they are not exposed to the correct information by adults who know better. And, as stated at the top of the blog, this is family entertainment and I'm here to represent the rest of the family. Given the random politics, I think it's distinctly possible that there IS no "Queen of Arendelle". Rather, this is just a very rich, very eccentric family, and the townspeople just give them a smile and a nod because the town is pretty much financed through their taxes alone. Failure to attend to certain necessary details make a show weak. Attention to the same details make it strong. Attention to detail makes for a multi-level performance, not just for the children watching it, but for viewers of any age. It gives the work "replay value" and prevents it from being the sort of childish thing that one can outgrow. It also lends a satisfying richness that you don't otherwise get. In this thing, it takes 8 minutes for this story to stop making sense, and by 8 minutes and 13 seconds exactly you know -- if you're paying attention -- how it's going to end and who with. When a show is more enjoyable when you're not paying attention than when you are, they're doing it wrong. My point isn't that the show isn't superficially enjoyable. The music, for instance, is catchy and well-written if you discount it being discontinuous with the culture portrayed. The animation is usually well done except for notable instances where the directors deliberately chose to "break" their physical set. And indeed there is foreshadowing and symbolism, which is something you should find in every great work. Nevertheless, despite being memorable, the music is culturally inappropriate ("discontinuous", "disjointed", and "jarring" are other adjectives that come to mind). Despite being well animated, the showpiece scene is broken. Despite having foreshadowing and symbolism, they are poorly crafted. Because it has what you'd find in a great work, that doesn't make it a great work; just as an under-cooked meal isn't a great meal even though it has all of the right ingredients in exactly the right amounts. I saw the symbolism. It's impossible not to, because a 12-year-old could have written it (although I did enjoy subversion of the "true love's kiss" meme). It's not the fact or lack of its existence that bothers me, it's the lack of attention and poor craftsmanship. They did not attend to simple things that, if attended to, would not have slowed down or harmed the movie in the slightest. Many of them -- most -- don't even require dialog to fix. Some might further the education of a child. All of them would add to the richness of the work. I was expecting a GREAT work. I saw a GOOD one instead. Despite how you feel, *I* did not enjoy it as much as I COULD have IF they had crafted it better to take care of the blatant and glaring flaws which I specifically note, MOST of which I saw on the very first viewing. Now, I'm not telling anyone not to see the movie. YOU are certainly welcome to like it for whatever reasons you do, to whatever extent you like it. But I'm not telling you what YOU should think... I'm telling you what *I* think. While they give a more-or-less satisfying ending, it's spoiled by the ride that gets you there. I include in that spoilage the marvelous musical numbers, which would be perfectly fine on their own, but are completely out of place here and don't pay the slightest homage to the culture from which this story is drawn. To make sure you know exactly how far they were from the mark, they include a token bit of traditional music in the opening credits. The movie is visually stunning, but even there it has problems. For instance, in the signature sequence, "Let It Go", Elsa walks FAR out onto the balcony in the closing moments of the song. Then she delivers the zinger, "The cold never bothered me anyway," and doors SLAM shut immediately. WHERE ARE THOSE DOORS? She's hell and gone from the doorway. There are no doors on the railing... we saw it in a crane shot. But the directors wanted the moment and didn't care that they had to break the scene to get it. They were counting on us not to notice. For the most part that was correct: there are scores of reviewers that don't notice jack, and they gush and gush. It made me wonder what they're reviewing. Like I said, not their strongest screenplay. That it won awards for Best Animated Film only goes to show how ripe this category is for improvement; and how effective a popular song and technology are at covering up a bad script. Now, just because I think that Frozen could be better than it is doesn't mean that I thought it was garbage. As I said before, I thought it was good. In fact, if I didn't mention something, it's pretty safe to assume I either liked it or didn't mind it. For instance, although we know as soon as Kristoff arrives that there's going to be something wrong with Prince Forgettable, I like that the actual moment of that revelation is difficult to predict. I also really enjoyed Kristoff's subversion of the "talking animal" meme. As he's talking for his reindeer, he strikes me as a borderline nutcase, and the thought of a "Disney Princess" falling for a "Loony Toon" appeals to me. I also like the fact that the closer he gets to Anna emotionally, the less he employs that affectation. At the end he drops it entirely, even though it's clear what "Sven" would say. It's really the only indication that this is an affectation, and Kris isn't non compos mentis. I almost wish he were. Has there ever been a genuinely mentally ill Disney hero before? I dunno. Likewise, I don't mind Olaf the Snowman, which surprised my kids. Yes, he's rather transparently there to toy with you emotionally, but that's the nature of comic relief. and he gets to say the obvious and occasionally pithy things, including this observation on sacrifice: "Some people are worth melting for." That's a nice line. Let's end with that.